Bass and piano hang a low note in the air. A sarangi asserts itself as the voice of a sad worldly wisdom. That Ab (or A; I am too engrossed in this beautiful music to pause the CD and check with an instrument or tuner) in the bass, shimmering cymbals, and crystalline piano chords weaving around that ancient voice. The groove and structure of the tabla, bass, and piano make their entrance, and the sarangi establishes the melody and explores its possibilities. 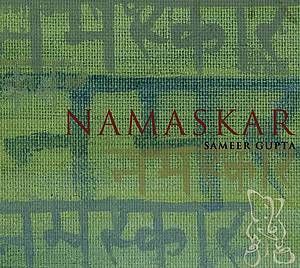 Thus does “Aaye Ne Balam,” the first track on Sameer Gupta’s Namaskar CD begins. 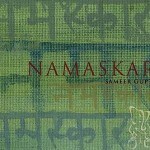 Namaskar is the brainchild of tabla player, drummer, percussionist Sameer Gupta. Gupta is a virtuoso percussionist who’d studied with Pandit Anino Chatterjee, and Ustad Zakir Hussain. He has performed all over the world with greats such as Marc Cary, The Supplicants, Anindo Chatterjee, Ramesh Misra, Chitresh Das, Richard Howell, Snehasish Mozumdar, Srinivas Reddy, Prasant Radhkrishnan, Marcus Shelby, Parijat Desai, Stephen Kent, Sekou Sundiata and others. He also plays with other projects such as Marc Cary’s Focus Trio, The Supplicants, Australian Bebop Ragas, Kosmic Renaissance, VidyA, and others. The Namaskar project has several members. The CD features Marc Cary (piano, keyboards, laptop), Anindo Chatterjee (tabla), Ramesh Misra (sarangi), Srinivas Reddy (sitar), David Royce (saxophone, bass clarinet, effects), Prasant Radhakrishnan (Carnatic saxophone), Charith Premawardhana (violin), and David Ewell (bass). The music is a unique approach to Indian / jazz fusion. Many of the compositions were taken from Bollywood, old folk songs, and traditional ragas. There were other intriguing sources, which I will mention later. But the approach Gupta and crew take to the music does not in any way produce the kind of results one would expect. This recording has produced music greater than the sum of its parts, and ventures into a direction that has seemingly never been explored before. Cary’s keyboard, Royce’s saxophone, and Gupta’s kit drumming injects a jazz flavor and sensibility into everything it appears on. And the electronics that appear bring it further from the older styles. Yet, India is always present. Some of the highlights include “Love’s Lying Story,” a sad ballad with an almost angry subtext. “Jangle” is a jazzy environment wherein Reddy’s sitar and piano spreads their wings against the Gupta’s tabla played at breakneck speed. “Puriya Harlem Dhanashree” transforms the classical raga puriya dhanashree into an excursion into the jazz underground. “Attachment” I can best describe as pretty. Watery and idyllic. “Thumri” is the most traditional piece on the CD, with the sarangi playing most of the melodic parts; although the Rhodes piano sprinkles its seasoning on the music. “Raga Misra Shivaranjani In Mishra Tala” takes the sarangi into an unfamiliar territory, with the kit drums playing the tabla’s parts. “Blue in Green (Raang)” is an exploration of the old Miles Davis classic, leading the Rhodes, drums, and bass through tabla land. I’d have liked to have heard what the sitar and sarangi do with this though. Namaskar is a brilliant offering. If this is where the meeting of different cultures is heading, neither we, our children, nor their children have anything to worry about. We have a bright future. Concert review: a night of Indian-American music, another example of great local talent reaching forward into new territory! Interview: Susmit Sen (India) – India’s Jerry Garcia? This entry was posted in CD Reviews and tagged Sameer Gupta on May 10, 2013 by Sohrab Saadat Ladjevardi.